STOP HS2 | Secret HS2 Documents Question if Phase 2 is Affordable. 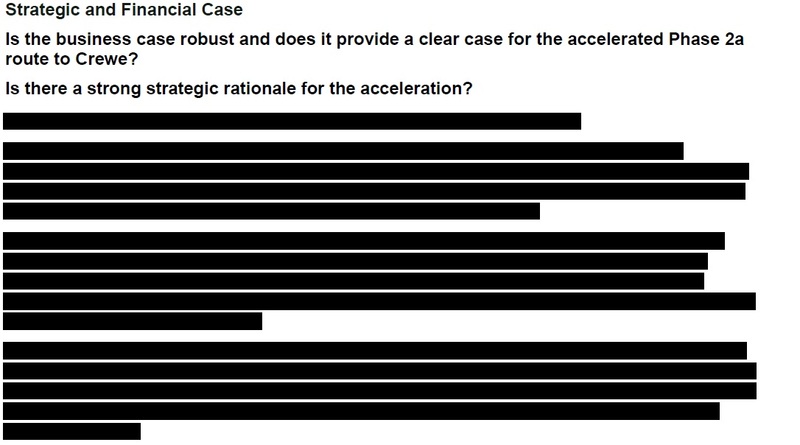 It is impossible to determine what the IPA thought of the plans to accelerate the plans for Phase 2a to Crewe as the answers to the questions “Is the business case robust and does it provide a clear case for the accelerated Phase 2a route to Crewe?” and “Is there a strong strategic rationale for the acceleration?” have been redacted in their entirety. Whilst the costs of HS2 officially increased to £55.6bn just after the final report was completed, HS2 Ltd have consistently claimed this increase was purely to take account for inflation, to update 2011 prices to 2015 ones. However, a previous FOIA request has shown that this is not the case, with the Phase 2 cost having increased by 39%. 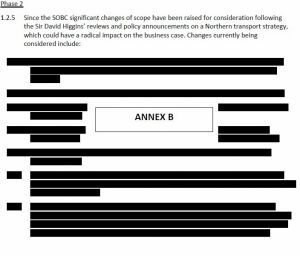 This confusion about costs is highlighted in these documents, as it is notable that references to the actual costs of HS2 Ltd were working to have been redacted. Despite the fact that changes to Phase 2 were announced in 2016, the options which were being considered in 2014 have also been redacted in full. Concerns about the timetable come up throughout the documents, which when compared together make it clear that the project is significantly late. In the September 2013 report, enabling works were meant to start in 2015. By the 2015 reports, these enabling works were due to start in 2016, with the July 2015 report stating “There is only a four month float in the overall ten year delivery schedule”. Given that enabling works only started in 2017, this float has already been surpassed. However, instead of admitting this, HS2 Ltd and Government have continually denied there have been any delays to the project, and have now attempted to ‘rebrand’ the enabling works as construction so they can claim construction has started on time. One of several incidences of HS2 Ltd redacting the costs they are actually working to. Whilst some of the reports rate HS2 as ‘amber’, the annual report of the IPA has rated HS2 as ‘amber-red’ consistently for the last five years, making it officially the worst-run project on the Government book. Well done Joe-will your or someone’s MP be raising this in parliament when it reconvenes.